I thought this little guy would be cute peeking out from some candy hearts. I started by die-cutting a piece of white cardstock for the bottom panel and inking it with Dried Marigold, Picked Raspberry, Worn Lipstick and Abandoned Coral distress inks. I die-cut the top panel using a large heart die and inked a soft area at the top with Spun Sugar distress ink. I die-cut various hearts and inked them with the same distress inks as the background and then stamped and heat embossed the sentiments from this set. They worked perfectly for candy hearts! I colored that adorable little panda with Copics and added some colored pencil detail. 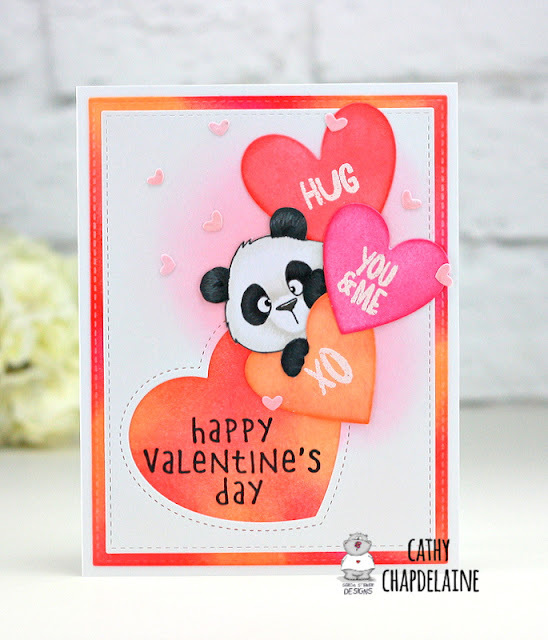 To finish, I stamped the Valentine's sentiment from a new Gerda Steiner stamp set that's soon to be released. You won't want to miss this new set either! Hope you have a great weekend and just a few more days until the shop opens again!